Savannah is Missing from Hammond Indiana. Last seen at my house. 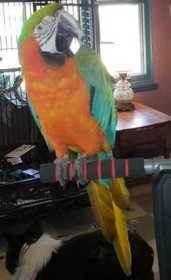 She is a Ruby Gold Macaw could also be Identified as a Harlequin she is 2.5 years old. She may be in Chicago after someone was here the other night from Chicago.